Work is moving ahead swiftly on the biggest bridge-building project in Serbia for more than 30 years. 929 m long and with 200 m tall bridge piers, the Sava Bridge is set to become a modern-day landmark of the Serbian capital. The ten-lane cable-stayed bridge across the Sava River aims to alleviate traffic congestion in Belgrade and thus to enhance the quality of life in the city. A recently erected footbridge has been ensuring the necessary safety on part of this huge construction site. Thanks to the ingenious solution designed and supplied by Doka Serb, the many people working on-site can cross the road safely and get on with this major infrastructure project without having to wait for passing traffic. On the main bridge, too, fast construction progress had already been made with tailor-made formwork solutions from Doka. The Load-bearing tower Staxo 100 system is also being used on the pedestrian bridge, in conjunction with the Doka stair tower. The erection and use of this elevated pedestrian crossing shows yet again that Doka stands for fast, safe solutions on the site. 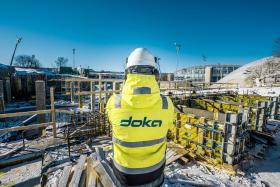 Thank you for your interest - Doka Safety from A(ustria) to B(elgrade). Thank you very much for your interest - Doka Safety from A(ustria) to B(elgrade).